Roscoe is a nice gelding with great ground manners. 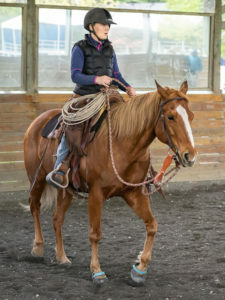 He has been a champ on the trails and has learned to work well in the arena and respond to directions from legs, seat, and reins. We’re pretty sure that Roscoe was ridden in his past but probably never anything more than “get on and go” on the trails. He is not a push button horse, but he is getting better about lining out and staying on the rail or circle when working in the arena. He trailers, stands for the vet and farrier and is generally well behaved in turnout with other horses. We think he may have been a later cut stallion because he has a fairly strong personality…he’s not aggressive but he’s not submissive to herd mates. He is a bit herd bound, especially with mares, but can work out of it and responds to support from a handler to gain his attention. He has already show great improvement in this area. 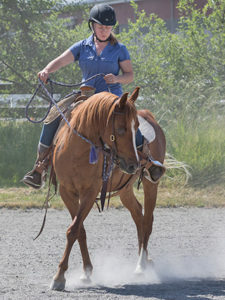 He successfully works alone in the arena, regains composure when other horses leave, and has been able to tie and stand quietly alone without other horses near him. We took him over the weekend to his first show and he did very well. 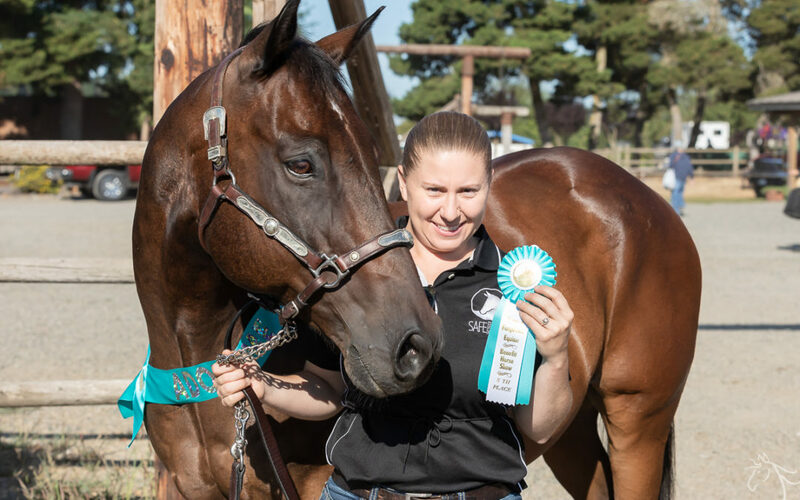 He settled in nicely in the new environment and worked well under saddle, on the trail obstacle course, and in halter and rail classes. He did show some signs of aggression towards new horses he did not know but his handler was able to keep his attention and correct him if he gave a bad expression to a passing horse. It was manageable but full disclosure, it’s something he still needs to work. We really like Roscoe —- he has a genuinely sweet disposition. 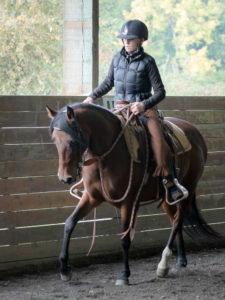 He will require at least an intermediate handler when introduced to new places and horses but in a comfortable, familiar environment, he is very trustworthy. He can be a bit pushy, trying to lead you and walk ahead, but he’s easily corrected and once he knows his place he is respectful. His only physical fault is a toed‐in front left hoof. We suggest working him in boots or putting front shoes on him, as he is starting to wear out the outside of his toe. He has been sound without issues. With the work we’ve been doing, he is gaining strength. By freeing up his feet, his movement has become forward and he is becoming more responsive and less reactive. He is a brave horse and if he sees something new, he is smart about it and trusts his rider to keep him safe. He leads, follows and, with a strong partnership, would probably go out on a trail alone with his rider.